A former leader of the Labour group on Carmarthenshire council has left the party, accusing the local leadership of "bullying and harassment". Jeff Edmunds says the treatment of some longstanding councillors has been "appalling and totally unacceptable". 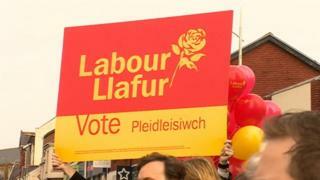 He is one of nine town and county councillors to have quit Labour in Carmarthenshire over the past 24 hours. Current Labour group leader Rob James called on the defectors to quit their seats and defend them in by-elections. He was elected as leader of the Labour group last year at the age of 30, becoming one of the youngest Labour leaders in Wales. The five former Labour members of Carmarthenshire County Council and four Llanelli town councillors will now sit as independents. Mr Edmunds said in a statement that they were leaving the Labour Party with "deep regret and a heavy heart". "We cannot remain as members of the Labour group of councillors as we believe the current leadership is adopting bullying and harassment tactics to 'whip' its membership, along with other practices that we can neither accept or condone," he said. "We could not agree with the way the current leadership is seemingly creating a culture of 'divide and conquer' within the group in preference to one of harmony and unity," he added. The statement also claimed that more councillors may join the defectors, who say they feel like "outcasts". Until the defections Labour had 23 members of Carmarthenshire council, which has been run by a Plaid Cymru-Independent coalition since 2015. In response, councillor James said he was "extremely disappointed that the former leader of the Labour group has chosen to be a divisive character in the group since losing the leadership" and had "now decided to throw his toys out of the pram and leave". "Politics is not about your own financial interest, it is about serving the communities that elected you," he added. "Residents voted for Labour councillors in these wards and it is only right that all those that have defected put themselves forward for election."